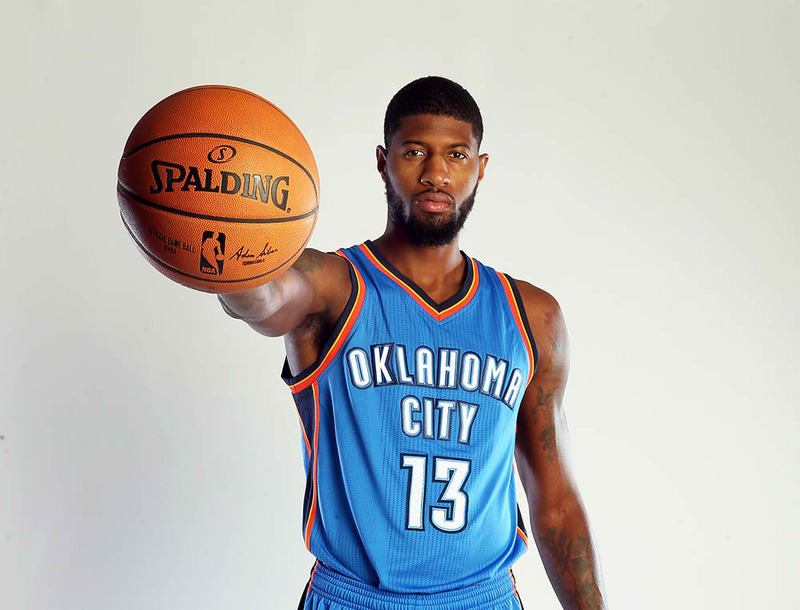 The Oklahoma City Thunder hit the jackpot during the NBA offseason, flipping Victor Oladipo, Enes Kanter, and a bunch of other guys for all-stars Paul George and Carmelo Anthony to form a formidable line-up bannered by their new-look Big Three. Obviously, the arrival of George and Anthony on paper to a squad that just had Russell Westbrook go supernova last season en route to winning the regular season MVP award could only make their fans think of positive things heading to the 2017-18 season. 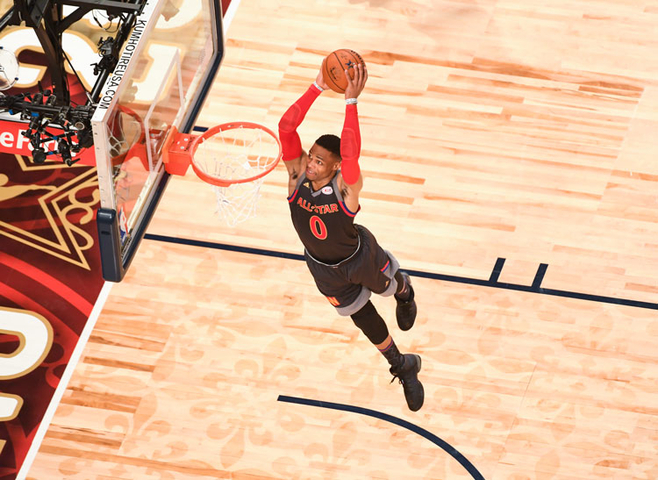 Westbrook carried the Thunder by himself to a 47-35 record in the competitive Western Conference, wounding up with the sixth seed in the playoffs. Now with more support, the argument is that Westbrook won’t have to average 30-10-10 again while both George and Anthony are there to do their respective duties and second and third options. All three stay fresh, have their moments to shine, and lead the Thunder to success. The challenge now is to prove they can do it consistently for the entire season; OKC doesn’t really have that much of a choice, considering George and Anthony will both be free agents next summer, and the success of the team might be one of the crucial factors that could determine whether they both get convinced to stay for the long-term or not. Not every Big Three-led team succeeds the first time; though the 2008 Boston Celtics were able to do it, the 2010s Miami Heat, 2015 Cleveland Cavaliers, and even the core group of the Golden State Warriors had to undergo struggles. But the advantage is that the Thunder have more starpower to try and do different things. Head coach Billy Donovan now has the difficult task of leading the squad deep in the playoffs. As the clear-cut best player and top option, Anthony took 18.8 field goal attempts per game last season for the New York Knicks. 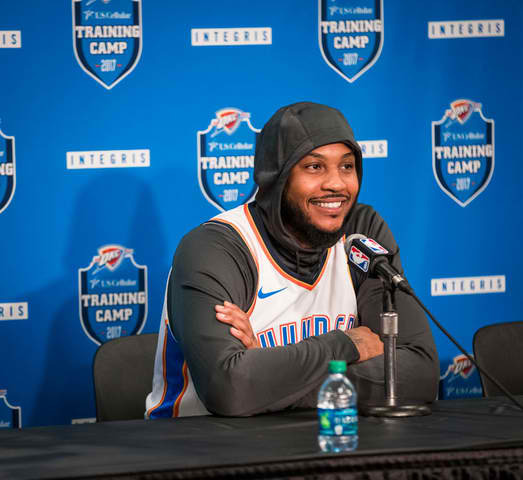 But in the preseason, we are seeing a version of him closer to the USA Melo where he doesn’t mind not being the only option when all three of them are on the floor. Anthony is also shooting 41.7 percent from three-point territory in the preseason while not having to demand the ball quite often. We all know Anthony has often been referred to as a ball-stopper or ball-hog in his New York days when he has not gotten that much talent around him. He will have a new role especially when Westbrook is on the floor. Anthony will be an ideal catch-and-shoot guy and someone you feed when mismatches are there. The space he gives and the threat Westbrook poses when he has the ball should help open those lanes. George, meanwhile, ranked third behind Jeff Teague and Lance Stephenson in assists per game for the Indiana Pacers last year, averaging 3.3 dimes a contest. George knows how to playmake too, and he is a threat on the floor with or without the ball. 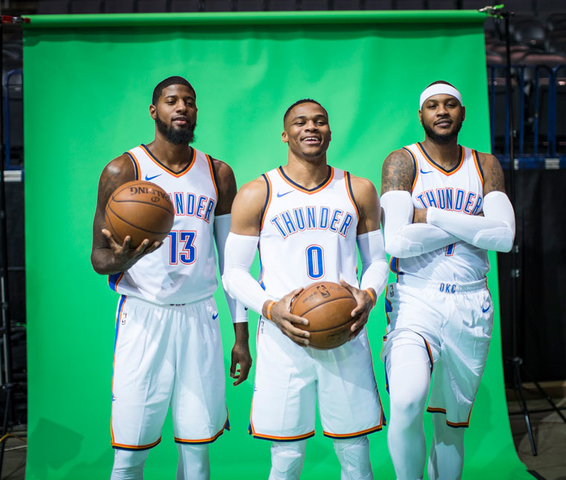 When all three are together on the court, there are many options for Donovan, and the average defense will surely have to make decisions on how to approach the Thunder. But what is more interesting to follow here is how Donovan shuffles his line-up. While Westbrook carried the entire team by himself last season, he averaged only over 34 minutes a game. And in the minutes he sat down, the Thunder flat-out stunk. The Thunder were 10.5 points per 100 possessions better when their MVP is on the court, but he is not on the floor, the team has a minus-8.9 net rating. They simply didn’t have anyone outside of Westbrook who could create or lead. With the two other all-stars now in fold, those numbers are poised to change. We saw a glimpse of how the Thunder might perform this year in their preseason opener against the Houston Rockets, when they didn’t have Westbrook and started Raymond Felton. Iso Melo took charge early, while George had his turns at leading the squad. Now with George and Anthony, Westbrook may be able to enjoy the same amount of rest (or even more) without the Thunder suffering that much. Both George and Anthony can score and create. When Westbrook isn’t around, PG/Melo + bench line-ups should be more competitive than the bench line-ups Donovan had prior to this year. At the same time, we have seen what Westbrook can do, so whenever his fellow Big Three members are given a breather, Westbrook can just return to his 2016 self and flat-out go berserk. OKC may not be that deep in terms of talent and playoff-ready players outside of their Big 3, which is why Donovan has to make sure they stay competitive by managing the minutes of the three all-stars well. OKC has to make sure they always have a leader on the floor, and try to win every minute of every game. And unless that happens, George’s musings about OKC being a championship team will end up just being gut-feel rather than an accurate description.